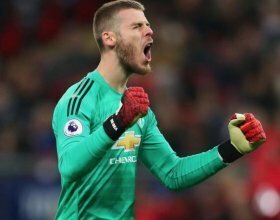 De Gea has just 15 months remaining on his current deal with the club and so far, there has reluctant to pen an extension with United unwilling to match his £350,000-a-week demands. As such, it appears that United could be forced to sanction the Spaniard's sale in the summer and The Express claims that they have already earmarked a couple of options to succeed the shot-stopper between the sticks. Everton's Jordan Pickford and Atletico Madrid's Jan Oblak have been noted as the names on their summer wishlist, but the former seems the most viable option for the club at the moment. Pickford is currently said to be valued at around £60m following his tremendous growth over the past 21 months at Everton, and he is regarded as a cheaper choice when compared to Oblak. Atleti are understood to want at least £86m for the Slovenia international and they are unlikely to settle for anything less to do business for the former Benfica man in the summer.